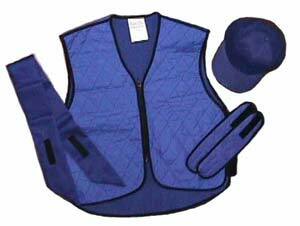 Evaporative cooling vest, neck wraps and more! These garments harness the COOLING ENERGY that is produced when water naturally changes from liquid to gas (evaporation). Our Polymer Embedded Fabric is sewn into each garment lining and functions as a powerful liquid management system. Our Evaporative Cooling Apparel is activated by simply submersing it in water for 1 to 3 minutes, or until it reaches the desired level of hydration. Gently wring out excess water and its ready to wear. Once activated, the garments will provide hours of cooling relief and are an effective way to combat Heat Stress. Evaporative Cooling Kits -HYPERKewl A Great Value! Simple V-neck w/ zipper closure: work for a wide range of people and uses. Comfortable, quilted nylon outer w/polymer embedded fabric inner, water-repellant nylon liner, and black cotton-poly elastic trim. water for 1 to 3 minutes then gently wring out excess water and it is ready to wear. Once activated, the garments will provide hours of cooling relief. Looking for great prices on evaporative cooling products? Feel free to browse our selection of body cooling system products. All of our cool vest products are offered at affordable prices. When it comes to evaporative cooling products, we are your experts.